It’s the typical weekend routine for any Kiwi – going to the beach, walking on the sand, taking in the warmth of the sun – it’s all fun and enjoyment. Now imagine sitting in the parking area, looking at the beach from a distance, thinking about touching the sand, and wishing you were there on the beach instead of out here near the footpath. Living a disabled life isn’t easy, but small things can make it a happy one. Gestures like beach access can mean a lot to specially-abled people. And it can be made possible with something as simple as a plastic beach mat. A plastic beach mat was trialled on Mount Main Beach and Pilot Bay last year and it gave a chance to the local wheelchair-bound people to visit the beach, feel the sand, and experience the waves. The trial was successful and brought a lot of happiness to the community. The Tauranga City Council is now looking for sponsors who can fund the installation of these mats. The mat used for this project was chosen carefully as it should be impermeable to sand, lightweight, and easily foldable. Its flexibility allowed it to be used at different locations. The mat chosen for the project had an anti-sliding surface that let wheelchairs roll over it without slipping. It was also easy to clean and repair. The mat could be used on a semi-permanent basis for many hours. Since it was lightweight, it could be rolled and carried to different locations to provide access from other points as well. The 60m long and 1.5m wide polyester mat was rolled out on December 10 and 11, 2016 as a trial. A 10m roll of the mat cost $2,500 and worked on soft sand. A 60m mat would be perfect for a start, and later more could be used. Multiple mats could also be used at different beach areas. 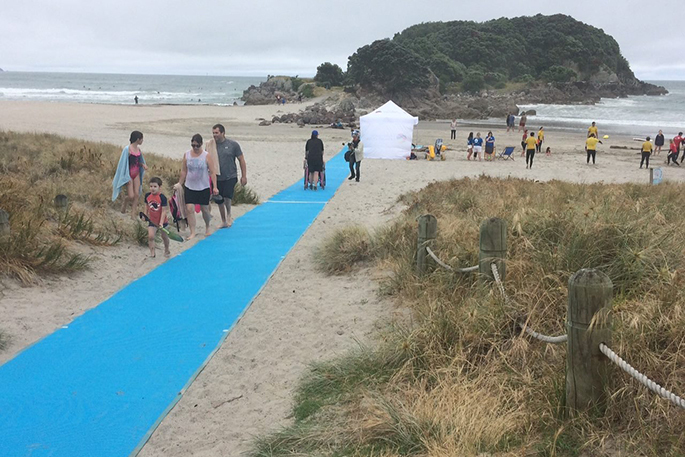 This would make it the first beach in New Zealand with access mats. Cherryl Thompson, the Disability Sports Advisor at Halberg Trust reports that she has received several letters of support for the mat. New Zealand has some of the best beaches in the world and not having equal access is just not right. Summer of 2016 was important for the specially-abled people of Tauranga as they were able to feel the excitement of coming close to the waves. They would otherwise sit in the car while their family went to the beach for fun. It’s also more comforting for them as they can see their kids playing safely on the beach and not going too close to the ocean. This year, the Tauranga City Council will provide the maintenance and storage of the access mat that will help in providing access to different points on the beach. This will also help in 2017 Anchor AIMS Games in September. There is an estimate of over 10,000 visitors for the games. This year, there will be one cross country event and three swimming events for the specially-abled athletes. They will be given provisional classification by the Paralympics NZ. All times of the event will be recorded, and it will set the first national Paralympic records. Bigger projects are often outside the scope of small businesses. However, this project needs a small contribution and gives a chance to everyone to do their bit. With the new project, many specially-abled people were able to play with their kids in the sand. This project received an overwhelmingly positive response and the stakeholders were happy and excited. With easy access to the beach, this project completes the kiwi experience.